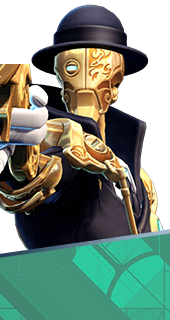 Predatory Strike is an Ability of Marquis in Battleborn. Deploys Hoodini to a target location. Hoodini reveals nearby enemies on the map and collides with them, dealing 208-280 damage. Up to 3 owls can be active at once. Increases Predatory Strike damage. +15% Damage. Increases Predatory Strike's bonus damage. +25% Bonus Damage. Predatory Strike owls on the battlefield are cloaked. Predatory Strike owls behave like sentries, and can fire on nearby enemies twice before detonation.